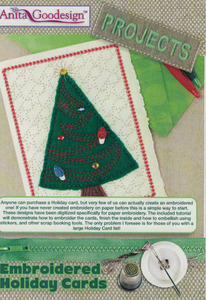 Anyone can purchase a Holiday card, but very few of us can actually create an embroidered one! If you have never created embroidery on paper before this is a simple way to start. These designs have been digitized specifically for paper embroidery. The included tutorial will demonstrate how to embroider the cards, finish the inside and how to embellish using stickers, and other scrap booking tools. The only problem I foresee is for those of you with a large Holiday Card list!